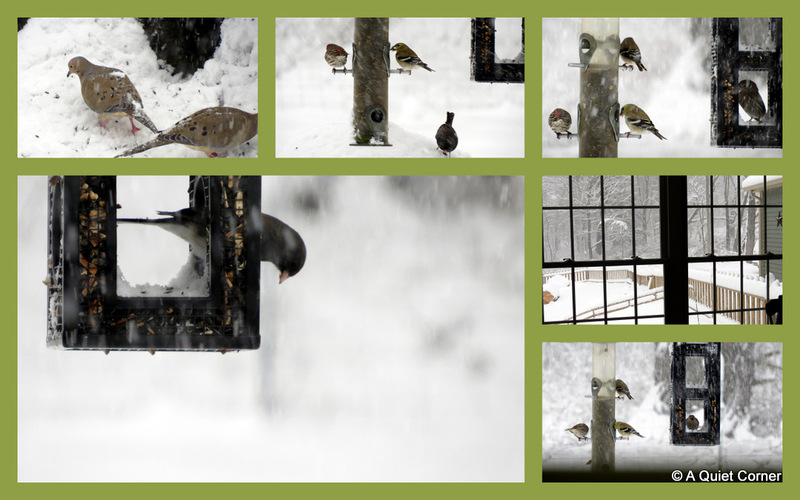 Standing near the kitchen sink, I couldn't help but notice all the birds at the feeders. We had House Finches, American Gold Finches, Black-Capped Chickadees,Titmouse, a Nuthatch, several pairs of Doves and the Cardinals. The Pres had just walked over to pour his glass of OJ. It was then that I saw movement in the thick twisted vines that hang down from the hundred foot white pine. The thicket is only about 75 feet away from the house. Quickly stepping over to the granite divider between the entry way and the great room, I grabbed it with one hand, removed the lens cap with the other and hit the power button all while taking those quick steady steps back toward the kitchen window. "Where's is it?" I said out loud, pressing my eye to the viewfinder. Nothing. I saw nothing. I waited for what seemed an eternity...like the lioness stalking her prey. I could feel the excitement building. Waiting...waiting until I realized that all my feeders were now empty. Not a bird in sight. Everything remained still...completely motionless. Then I saw it move again through the tangled vines and brush. There it was sitting in back of the fence. I didn't even finish "zooming" when I decided to snap the picture while I had the chance. I didn't want to pass it up. It then took flight landing deep into the woods on the South side of the house but I never found him again. What I did notice though was that my feeders remained empty for about 20-30 minutes. Then apparently the little ones knew it was safe to come out. One by one they flew in, perched and resumed nibbling at the seed. I love this post. You really know the names of your birds.. I am hopeless .. I feed the birds on the ground. cant get bird feeders here.. they are not into it. How many times that has happened to me. I stand at the window..run of for my camera, but when i get back the bird has gone. The photo of the 'kite' or hawk is amazing JP. you didnt write what bird type it is..
We had a Cooper's hawk perch near a feeder once and all the birds left in a flash. Your bird is a beauty. Do you know what kind? What a pretty haw, I would have guessed it was a falcon, I've got to read up on the big birds more. We have the same exact variety of birds here at our feeder. You are so right, JP, that the feeder birds know when a predator is around. The cardinals and small birds would remain very still in the nearby trees and sure enough I spotted the sharp-shin hawk nearby. Always good to have "zoomed" handy! Jealous of your snow...all we're getting this weekend is more rain. pretty hawk. Your patience paid off. Yay! Lucky catch and love to see all those great birds at your feeders!